IPOs for Everyone: The 12 Secrets of Investing in IPOs. Founders of Renaissance Capital and the IPO Aftermarket Fund get in on the cutting edge of today’s economy. The business press has declared IPOs-Initial Public Offerings-dead seven times in the past ten years. Every time they’ve been wrong. Far from being deterred by the IPO obituaries, the authors of IPOs for Everyone show that these times in the IPO market consistently present the best buys. Once reserved for a select group of Wall Street pros, there are now many opportunities for individual investors to take advantage of in the IPO groundswell. IPOs have become a must-have for investors who wish to diversify their portfolio. IPOs for Everyone, reveals the twelve secrets used by the founders of Renaissance Capital, the leading IPO research and money management firm, to pick a winning IPO investment. This timely book provides the inside knowledge that investors must have to play the volatile IPO market successfully, including finding the best companies on the block, getting favorable pricing and seeking out buying opportunities in the aftermarket. are rarely good bets. But that may be changing. Maybe the only job tougher right now than being Bill Clinton’s spokeswoman is selling new stock on Wall Street. In the first two months of 2000, there were 70 initial public offerings. So far this year? Nine, a low not scraped since 1979. Five of these new stocks are already under water-cold certification that so far, 2001 is an IPO bear market. What should you make of this? If you’ve ever wanted to buy a new issue, now’s the time to get serious. For prospective IPO buyers, “this really is the best time, because there is no competition for these deals,” says Linda Killian, a partner at IPO investing boutique Renaissance Capital and co-author of the new book IPOS for Everyone, “They get priced to move.”. . .
Once reserved for a select group of Wall Street pros, individual investors have awakened to the potential of investing in IPOs-Initial Public Offerings. Written by the founders and portfolio managers of Renaissance Capital, the leading IPO research firm whose company Web site, IPOhome.com, was named “Best of the Web” by Forbes, this timely book provides the guidance investors now need more than ever to get the full benefits IPOs have to offer. The business press has declared IPOs dead seven times in the past ten years. Every time they’ve been wrong. Revolutions in technology and medicine, coupled with a global economy recognizing the power of capitalism, are fueling the IPO market with new companies. IPOs have, in fact, become a must-have for investors who wish to diversify their portfolios. In addition to revealing the twelve secrets to choosing a winning IPO investment, including understanding what a company really does, evaluating its management and whether it has enough money to compete, IPOs for Everyone provides the insider knowledge you need to play the volatile IPO market successfully. You’ll learn how to find the best companies on the block, get favorable pricing, and maximize buying opportunities in the aftermarket. 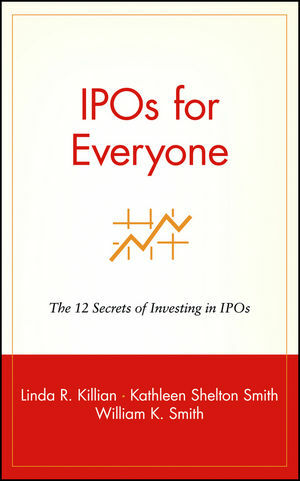 The authors’ 12 secrets to choosing and investing in IPOs. Inside knowledge of the IPO market. Take advantage of the expertise in this invaluable book-and gets in on the ground floor of today’s most rewarding investment opportunities. LINDA R. KILLIAN, CFA, has nearly two decades of investment management and equity research experience. Prior to founding Renaissance Capital, she was a portfolio manager and analyst with Citicorp Investment Management and Wertheim Schroder. KATHLEEN SHELTON SMITH has spent over twenty years working with IPOs as an investment banker and portfolio manager. Prior to founding Renaissance Capital, she was a director of Merrill Lynch Capital Markets’ Technology and Emerging Growth Investment Banking Group. WILLIAM K. SMITH is a founder and portfolio manager of Renaissance Capital. He was a senior investment banking executive with Kidder Peabody and Bear Stearns. He is the author of the book Strategic Growth Through Mergers and Acquisitions. RENAISSANCE CAPITAL, located in Greenwich, Connecticut, runs the IPO+ Aftermarket Fund, the first mutual fund focused on IPOs. For up-to-the-minute information on IPOs, visit Renaissance Capital’s Web site: www.IPOhome.com. How the IPO Market Works. The Way Wall Street Works: Why You Can’t Get IPOs and What You Can Do About It. How to Have IPO Intelligence. What Makes a Good IPO. How to Avoid Bad IPOs. Internet and Technology IPO Basics. The Potential of Global IPOs. How Management Helps or Hurts an IPO. Appendix A: Directory of Underwriters. Appendix B: Top 25 IPO Underwriters. Appendix C: A Short History of IPOs.